We haven't gotten much rain in San Francisco this winter. For me, it's meant that I can delay getting more rain-friendly commuter wear. Yesterday as I was walking in the rain in my bright red vintage velvet swing coat, I thought how nice galoshes would be for jumping in puddles. 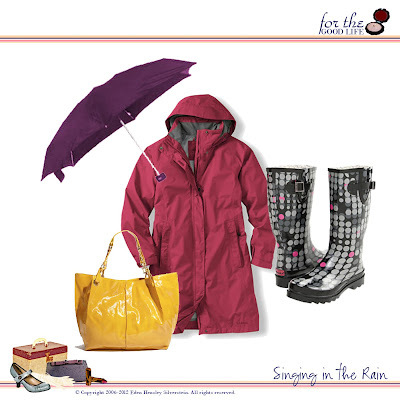 Totes Purple Umbrella, $19.85; Stowaway Gore-Tex Raincoat, Bright Berry, $189; Scatter Dot Rainboots, Chooka, $59.99; Steven Tote, Cotton Candy Patent Yellow, Steve Madden, $48.90. How do you chase the rainy day blues? Credits: All images taken by their respective sellers: L.L.Bean, Nordstrom, The Purple Store, and Zappos.com. Collage created by Eden Hensley Silverstein for The Road to the Good Life.